Both nitrogen and phosphorous are essential to life. Lynchpins both to global food production, circulating through synthesis or export and then through croplands and food into -- and out of -- our bodies, both elements today inhabit cycles that, in their own ways, function more in the breach. Phosphorous is a scarce resource. As ARNO ROSEMARIN tells us, it is the focus of intense geopolitical interest. 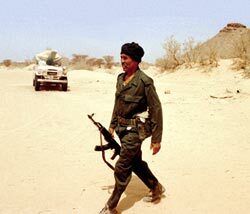 At the centre of this interest: internecine conflict in Africa, and a global rush for Western Sahara's reserves. Nitrogen is a resource in plenty. But, as T V JAYAN shows, that isn't helping. Indeed, the world today faces a nitrogen deluge. That's because a lot of it exists in the form of waste. And that's because the cycle has been broken. Now, nitrogen-bearing waste goes not back to the land but into water. Is it possible not to be at war with these two elements? It is therefore of interest to take a more in-depth look at other natural resources, which are limited in supply and which have a highly skewed geographical distribution. The case in point is the global supply of phosphorous, a non-renewable but essential nutrient for all forms of life. Phosphorous is about 10 times more abundant in living organisms than what is found in the earth's crust, thus demanding a "luxury" consumption mechanism. Phosphate rock is mined to produce phosphoric acid and elemental phosphorous. 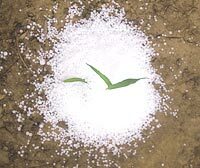 Sulphuric acid is reacted with phosphate rock to produce the fertiliser triple superphosphate, or with anhydrous ammonia to produce ammonium phosphate fertilisers. Elemental phosphorous is the base for furnace-grade phosphoric acid, phosphorous pentasulfide, phosphorous pentoxide, and phosphorous trichloride. Approximately 90 per cent of phosphate rock is used for fertilisers and animal feed supplements and the rest for industrial chemicals . Urbanisation and intensive agricultural practices have brought about the application of chemical fertilisers in order to produce adequate amounts of food. But we have neglected to close the nutrient cycle, and have instead chosen to exploit phosphorous and other important minerals without ecological controls (see flow chart: Tracking phosphorous). This has left us in a situation where little phosphorous is recycled either within populated areas or from agricultural land. Excess runoff and discharge of phosphorous in surface waters have resulted in eutrophication and algal overgrowth, which creates oxygen-poor conditions, reduces water quality and damages ecosystems. This approach to resource use has also made us highly dependent on expansive extraction of limited supplies. About one billion metric tonnes of phosphorous were mined between 1950 and 2000. During this period, about 800 million metric tonnes (one megatonne=one million metric tonnes) of phosphorous-containing fertilisers were applied to the Earth's croplands. This has increased the standing stock of phosphorous in the upper 10 centimetres of soil in the world's croplands to roughly 1,300 million metric tonnes, an increase of 30 per cent. Close to a quarter of the mined phosphorous (250 million tonnes) since 1950 has found its way to the aquatic environment (oceans and fresh water lakes) or buried in sanitary landfills or 'sinks'. Of the next billion tonnes of phosphorous we mine between 2000 and 2050, a significant percentage can be recovered by using sustainable agriculture and sanitation. This should be a priority for the global policy agenda. Many countries have trade pacts and joint ventures with Morocco for mining, extracting and shipping phosphorous. Morocco earned US $1.5 billion from phosphate exports in 2001. The Office Cherifien des Phosphates (OCP), a state-owned group which controls the phosphate industry in Morocco, contributes 2.6 per cent to the country's gross domestic product and 18.5 per cent to its exports. The Moroccan monarchy is the major shareholder in Omnium Nord Africain (OND), the country's largest private company, which controls the resources, including phosphorous. Phosphorous politics became even more complex in 2003 when China revealed to the world that it, too, had large phosphate reserves, about the same size as Morocco's. This news has gone almost completely ignored, but may be one of the most important developments that will determine phosphorous geopolitics. China and Morocco together hold about 70 per of the world's economic reserves for phosphate rock, estimates the USGS. But China appears to be holding on to its phosphate reserves for domestic consumption: according to the USGS its export share is less than 15 per cent of the reported production. China in 2002 imported 30 per cent of its phosphate requirements. The European Union, followed by the US, India, Australia, New Zealand and Brazil are the top importers of phosphate rock from Morocco, says USGS. Morocco in March 2, 2004 signed a free-trade agreement with the US. Issues that were hindering this agreement up to now within Morocco were related to food import controls (imports of subsidised wheat from the US will overtake domestic growers) and lack of free enterprise surrounding the phosphorous industry. Increased military aid from the US, an attempt to split Arab country alliances, is also part of this development. USA's phosphate imports come from Morocco/Western Sahara, and this dependency will increase over the next few decades. What does this all say then? It doesn't require very much analysis to realise that the geopolitical agenda for control of phosphorous is well advanced. But what is alarming is the little concern being shown by the world at large. How can leaders of the world dwell in this state of ignorance? In this great game for getting phosphorous, India is desperate. After France and Spain, it is the biggest importer of phosphate and phosphoric acid. It is one of Morocco's most important trading partners and has signed several joint ventures with it. An Indian company invested about US $230 million in 1998 for a phosphoric acid plant in Morocco. India has 260 megatonnes of low-grade phosphate rock deposits, but they are unsuitable for fertiliser production. Its position is similar to many other countries. Global population increase and the striving to increase the standard of living in many developing parts of the world will further aggravate the task of managing this limited resource. At the current extraction rate of 138 megatonnes per year, commercially viable phosphorous reserves will last 130 years. If one includes commercially unviable reserves, we can go on for another 130 years but at much higher prices. The demand for phosphate rock as a nutrient for food production will vary throughout the world. The overall demand is forecasted to increase by 1 to 2 per cent. In agriculturally mature countries, the increase in demand will be closer to 1 per cent per year. At an increased rate of 3 per cent, the world's commercially viable reserves would be depleted by 2060. But presently, the real concern should be the highly skewed distribution of phosphate reserves compared to where the needs are in the world. India, Western Europe and many other countries depend entirely on foreign sources. USA's commercially viable reserves are running out. Canada's wheat belt is totally dependent on phosphate from Togo at present. As reserves dwindle, food security will become the central issue in all countries. Daily protein intake in Asia in 1996, when the population was 3.3 billion, was about 15 gm per individual. Estimates for 2030 are a population of about 4.5 billion and a four-fold increase in protein intake, mainly as meat. This amounts to over a five-fold increase in meat consumption over 35 years. The ensuing increase in fertiliser to support this massive population growth will surely bring the question of limited phosphorous into focus. That USA's commercially viable reserves will be depleted by then, and that the geopolitical volatility around the world will only increase, make further the case for phosphorous limitations. By 2020, rock phosphorite may become the keystone resource of the world economy. As the world becomes more aware of the need to save and recycle phosphorous, certain characteristics of this mineral will unfortunately aggravate this response. Phosphate once applied to soil is not easily recycled. When applied as chemical fertiliser, phosphate transforms to less available forms (for example, from highly available dicalcium-P to less available octo-calcium-P). These forms then remain bound to the upper soil layer and can't be used by plants. Australia's Commonwealth Scientific and Industrial Research Organisation is trying to extract phosphorous using white lupine (Lupinus albus), a grain legume used for nitrogen fixation but which also excretes small amounts of organic acid from its rootlets. There will be attempts to gene-modify soil bacteria and plants in order to achieve higher phosphorous recovery. But even if biotechnology helps, it cannot give us abundant phosphate. Slash-and-burn methods won't help either -- they will affect crop cycles and could start millions of small fires around the world resulting in release of carbon dioxide and particulate matter. Recycling from sanitation and solid waste systems can be a partial remedy. The phosphorous we consume in foodstuffs or add to our laundry in the form of water softeners can be recycled, but our mixed and diluted solid waste and sewage systems make this very costly. Radical changes to these systems in terms of source-separation and containment (ecological sanitation) will be needed in order to make recycling economically viable. The present attitudes around fertiliser use within the agricultural sector were formed during the "Green Revolution" whereby nutrients were given the status of being limitless. As the population of the world has increased, energy resource questions have kept the fertiliser debate from developing. And more recently the recognition that water resources and soil are the largest present-day limiting factors in agriculture have further delayed any attention paid toward limiting nutrients and the need for their more frugal management. Whether the world reserves of cheap phosphorous become depleted in 100 years or even 200 years is a minor question when compared to the present situation regarding the heavily skewed global distribution. The geopolitics of phosphorous makes this one of the most precarious global resource questions requiring immediate attention. Arno Rosemarin is communication director and senior researcher at Stockholm Environment Institute, Sweden. Fossil fuel combustion has increased the amount of nitrogen oxides, which are blamed for the greenhouse effect. Large-scale cultivation of legumes, which support nitrogen-fixing bacteria, have also increased nitrogen in the soil. Fertilisers improved global food production in the last century by increasing the amount of nitrogen available to plants. But now agricultural fields in some countries have nitrogen in such massive quantities that plants can't absorb them. The nitrogen in fertilisers, present in a form called nitrate, is extremely soluble and so easily goes from soil to groundwater reservoirs feeding lakes and streams. Flush-and-forget sewage disposal systems improved sanitation, but have aggravated the damage to the nitrogen cycle. Instead of returning plant nutrients in human waste to the soil, sewage systems take them to treatment plants. Thus, the nitrogen in human waste too is reaching surface water bodies and oceans. Humans each year ingest nearly 20 million tonnes of nitrogen through food, all of which enters the environment. What's terrible is that while we consume 20 million tonnes of chemical nitrogen, 100 million tonnes of it is produced and supplied in the form of chemical fertilisers. About 32 per cent of the nitrogen fertilisers applied in USA each year (about 3.6 million tonnes) reaches surface water and groundwater, say Robert Howarth, David R Atkinson professor of ecology and environmental biology, Cornell University, USA, and other researchers. Their study shows that the excess nitrogen in USA's rivers had increased from 3 million tonnes in 1961 to 5 million tonnes in 1997, which is 45 per cent of the total 11.2 million inorganic nitrogen fertiliser consumed in the US in 1997. The Mississippi river in 1996 alone carried 1.5 million tonnes of nitrogen, says a paper by W R Raun and G V Johnson of the department of plant and soil sciences at Oklahoma State University, USA. Scientists say the global rate of increase in nitrogen was slow from 1860 to 1960 but the amount has now increased. The amount of nitrogen added to the environment between 1860 and 2000 has increased from 15 Tg (One terragramme is equal to one million tonnes) of nitrogen per year to over 165 Tg of nitrogen per year, write James Galloway, professor of environmental sciences, University of Virginia, USA, and others in a paper published in the April 2003 issue of BioScience. Half of all the nitrogen ever applied for agriculture was done in the last 15 years, says Howarth in a paper published in Ambio in 2002. Changing the natural nitrogen cycle has given us benefits: Almost 40 per cent of humans are alive today thanks to the substantial increase in nitrogen through fertilisers and cultivation-induced biological nitrogen fixation. The flip side: the runaway increase in nitrogen in the ecosystem has several serious environmental consequences, many of which are being noticed first in advanced countries. Scientists predict the global production of nitrogen will reach between 250 million tonnes to 900 million tonnes per year by 2100. What are the exact effects of this nitrogen deluge? High nitrate levels in drinking water can cause 'blue baby' syndrome or methaemoglobinaemia. In this rare but sometimes fatal condition red blood cells can't carry oxygen, which subsequently turns an infant's lips blue. Cases, particularly among infants, of stomach cancer and of non-Hodgkin's lymphoma due to nitrate-contaminated water have been reported. Nitrosamines, which are produced from a nitrogen form called nitrite, are reported to be carcinogenic. HARMING GREEN, CHOKING LIFE: Excess nitrogen chokes plants.